Meet the brand new phone number signup forms! 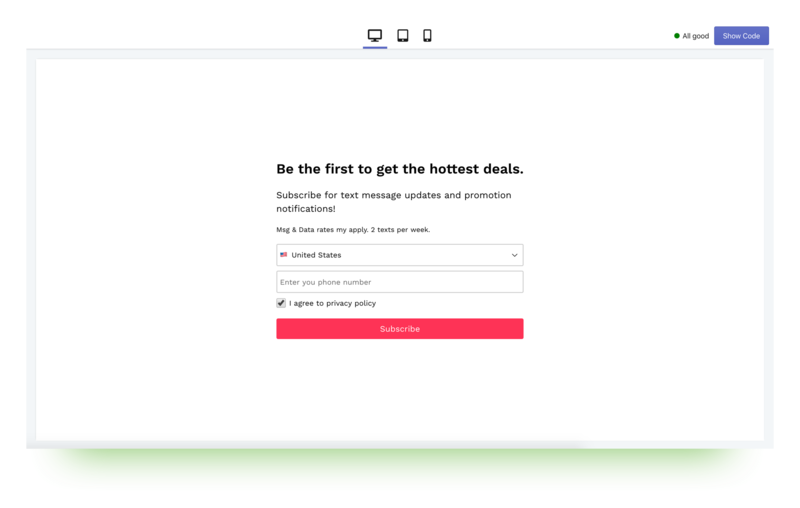 The Subscription Form in SMSBump was just upgraded to three completely different touchpoints for your audience and potential leads to interact with. New intuitive and sleek phone number signup forms will now let you start collecting more customer phone numbers and grow your SMS subscribers in Shopify with ease. 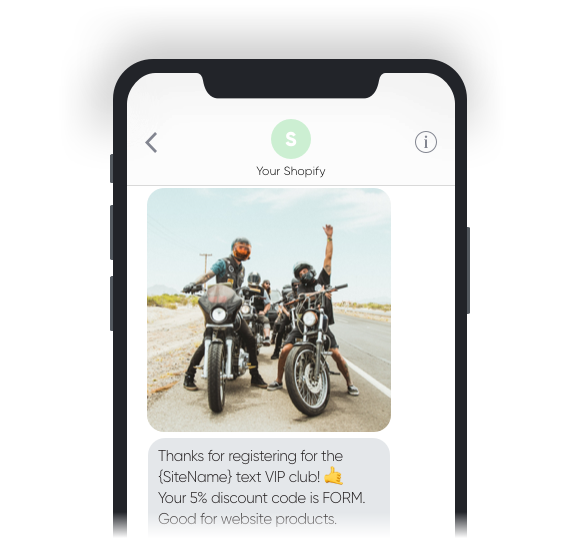 Design the E-Commerce signup forms for maximum effect and start turning your text messaging into an entire SMS marketing strategy from signup to conversion and long-lasting customer relationships. Build a captivating signup form with the brand new editor that lets you style your floating button, popup or embedded signup form to fit your Shopify online store design. Create a floating button that displays your phone number signup form. The customizable button has three different positions: left, right, and centered. Design a popup that captures the audience attention with an attractive offer and an instant phone number sharing experience. Generate the signup form and copy the code to embed it in any page of your Shopify E-Commerce website and start collecting numbers anywhere on your online store. Your SMSBump signup forms are now more than just a tool to collect phone numbers. They are an extension of your brand’s lead generation, segmentation, and customer retention strategy. 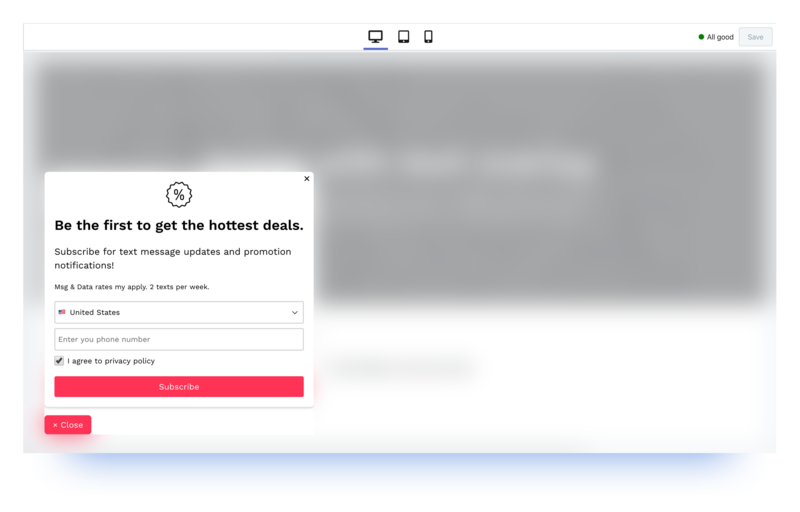 Turning your new website visitors into leads with beautiful signup forms is now easier than ever for growing your SMSBump contact lists. More contacts collected from your different phone number signup forms means more segmentation opportunities and even more targeting options for your marketing campaigns. Once you have the contacts and segments ready, you can start nurturing those leads to become life-long customers with relevant text messages to promote your brand and products. You’re in control when creating powerful phone number signup forms with the brand new editor. Custom buttons, custom forms, icons, space for your convincing copy and offers and different layout options for a clean or more detailed form design. 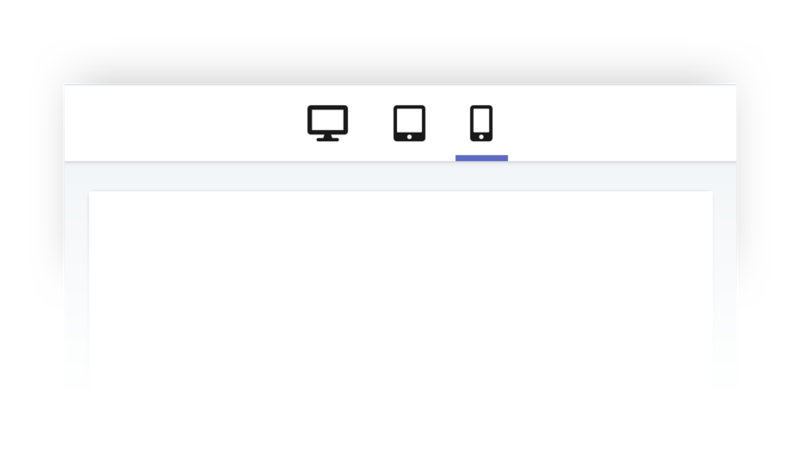 The switcher for the mobile signup experience preview lets you have a good idea of how your visitors will see the form on their devices. Changing this will show you how your phone number signup form will look on desktop, tablet, and mobile. Want to see how your new signup form will fit your Shopify website design? Simply use the Load site layout button to display your storefront in the background while you're customizing your SMSBump subscription form. 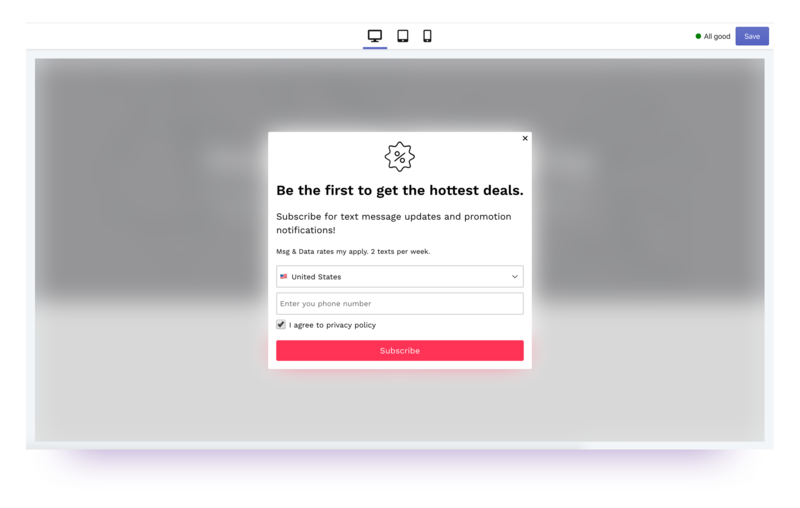 Personalize the signup experience for customers by setting up a welcome message introducing them to their new subscription. This is the first impression you will make on your new subscribers so make it a good one. A 5% discount code usually helps with that. The three signup forms have their own individual features that gives special benefits to each of them. For instance, the floating button is not so intrusive, but still as powerful, while the popup has its own behavior settings you can tweak. This new form option lets you build a floating button in your website you can place left, right, or centered. Customers click the button, your beautiful new form is displayed, and they subscribe for your text message updates & promotions. Assign the button to your website and once your visitors click it it will display the signup form itself. The flyout button offers a less intrusive way to display your subscription form since visitors need to willingly take action to reveal it. You can also customize the signup form that the floating button will display. The popup signup form can be set to appear with its own custom behavior that you define. Personalize the popup content, style, call to action and functionality to start building the mobile relationships with your customers. Choose the pages to display the popup to target the right audience and select the devices that the form will be enabled for. 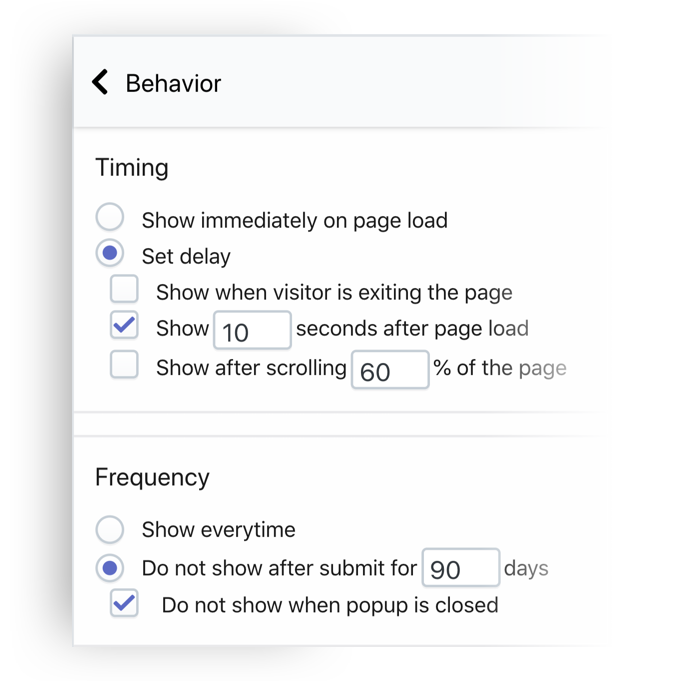 Set the popup display frequency and the right timing to avoid being intrusive, and yet captivate your visitor’s attention. You can turn the popup from a normal one to an exit-intent form that is triggered if the customer attempts to exit your site. This opens a lot of new opportunities to try and convert visitors into leads and nurture them into customers later. The final option is to create a custom signup form that you can embed into any page you want on your Shopify store. 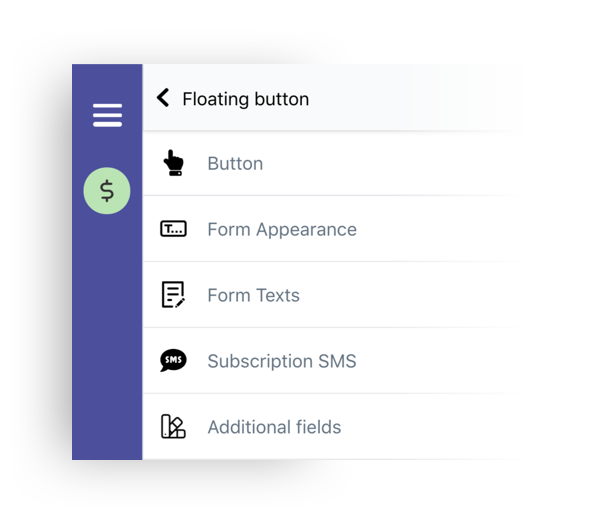 Build the form with the new SMSBump Subscription Form editor, customize all the styles, texts, backgrounds, CTA button, and form content to generate a line of code you need to use. Once your signup form is built, click the Show Code button at the top right. Copy the code and paste it in the liquid theme file you want to display your new SMSBump signup form. All the new SMSBump signup forms you create will be in your Subscription Form section where you can create new ones, edit forms and delete them. As you can notice, you can enable or disable the Published status of each form. This means you can create signup forms for special promotions and limited time deals that you can publish and remove when the time comes. You can have multiple signup forms enabled and displaying at the same time. Just be mindful and don’t overuse too much forms in one place so you don’t irritate your new visitors. We hope you like the new SMS subscription forms in SMSBump for Shopify! They are available now in the app so check them out and let us know what you think!